The Commonwealth of Virginia incorporated the Blue Ridge Railroad on March 5, 1849 to build 17 miles across the Blue Ridge Mountains. 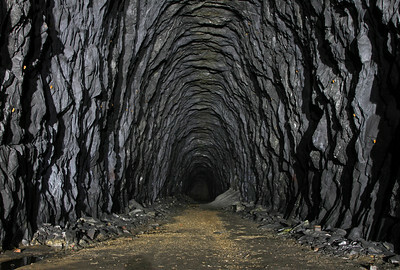 The route required four tunnels, by far the longest of which was 4273-foot Blue Ridge Tunnel near Afton, Virginia. Claudius Crozet, chief engineer of the Blue Ridge Railroad, was born in France and served in the French military under Napoleon. After Napoleon's defeat, Crozet immigrated to the United States and served on the faculty of the U.S. Military Academy at West Point before appointment as principal engineer for the Virginia Board of Public Works. Under Crozet's direction, construction of Blue Ridge Tunnel began in 1850 from both Waynesboro (west) and Afton (east) ends without the use of vertical shafts. With only hand-drills, pickaxes, and black powder, crews of Irish laborers and African American slaves drilled through bedrock for nearly seven years, far longer than expected. Frequent rockfalls necessitated temporary timber lining. Further, with the tunnel's western portal nearly 60 feet higher than the east, water drainage proved problematic when drilling from the west. Crozet designed a siphon of nearly 2,000 feet to drain the water, likely the longest siphon constructed by that time. 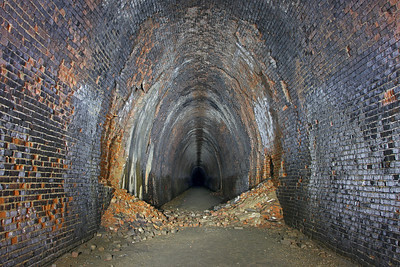 Then in the summer of 1854, a cholera outbreak halted construction and killed dozens of workers in and near the tunnel. Despite such obstacles, the two ends met December 29, 1856, just inches off alignment. 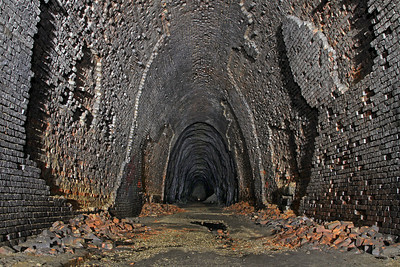 Brick lining was applied to the westernmost 1479 feet of the tunnel. Ventilation shafts were not required as the steady grade would provide a natural chimney. 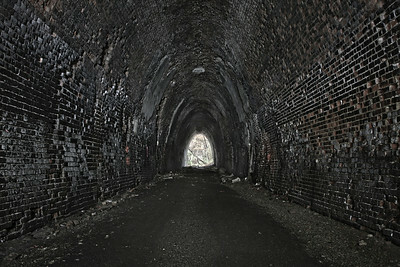 Blue Ridge Tunnel opened for service in April 1858. For four years before the tunnel's opening, beginning in the Spring of 1854, trains used a temporary 4.5-mile Mountain Top Track over the summit at Rockfish Gap, elevation 1885 feet. The western side required an average grade of 4.2% and maximum grade of 5.3%; the eastern side an average of 4.9% and maximum of 5.6%. Two Baldwin 0-6-0 tank locomotives powered three-car trains (or four-car empty freights) over the grueling grades, with typical speeds of 7.5 mph upgrade and 6 mph downgrade. 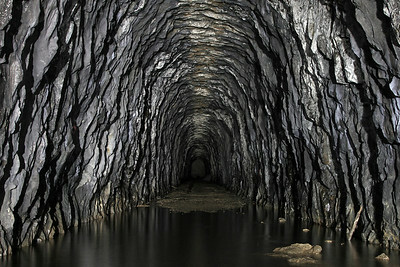 At its completion, Blue Ridge Tunnel was the longest railroad tunnel in North America but far shorter than England's 3-mile Woodhead 1 Tunnel completed in 1845. 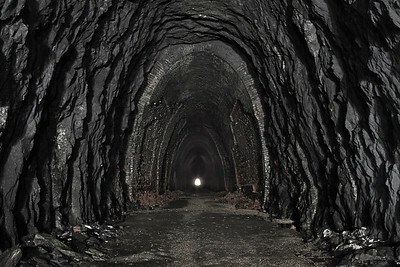 The tunnel length was eclipsed with the opening of Erie Railway's 4388-foot Bergen Tunnel No. 1 at Jersey City in 1861. Like Blue Ridge Tunnel, Bergen Tunnel was constructed with hand tools and black powder and predated the 1867 patent on dynamite. The state-financed Blue Ridge Railroad became part of the Virginia Central Railroad upon completion. 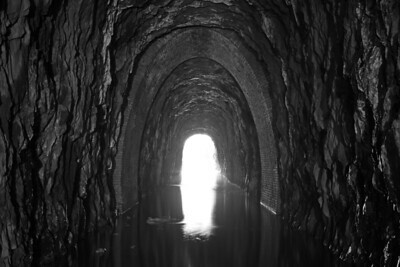 During the Civil War, Confederate troops utilized the tunnel on both train and foot. Shortly thereafter, the Virginia Central was merged into the Chesapeake & Ohio (C&O) Railway in 1869. 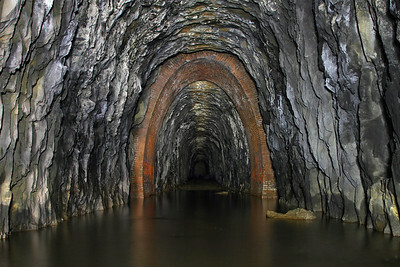 Construction of a parallel replacement tunnel began in 1941 and completed in 1944. The new bore accommodated larger railcars and reduced grades by tunneling approximately 20 feet lower than the original bore. 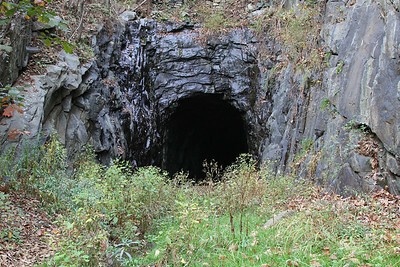 The new tunnel assumed the Blue Ridge Tunnel name while the original, abandoned in 1944, is now known as Crozet Tunnel. A plan was devised in the early 1950s to store natural gas within the original bore. Two 14-foot thick concrete walls, each with a two-foot diameter pipe, were constructed before the project was abandoned. Nelson County acquired Crozet Tunnel from CSX for $1 in 2006. 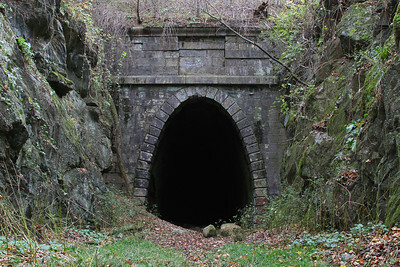 The county is seeking approximately $3 million in funding to rehabilitate the tunnel for use as a rail-trail between Afton and Waynesboro. Pending future use, Crozet Tunnel remains in good condition and is passable end-to-end. Multiple layers of brick lining have fallen in several locations. 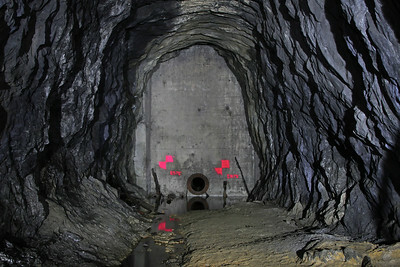 Water flows from the tunnel walls and collects to a depth of approximately two feet at the concrete walls and east portal. Wildlife in the tunnel includes eastern pipistrelle bats, copperhead snakes, pickerel frogs, bullfrogs, and cave salamanders. 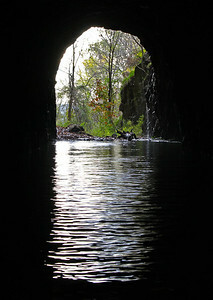 Details of the three other Blue Ridge Railroad tunnels may be found with the Greenwood Tunnel photos. 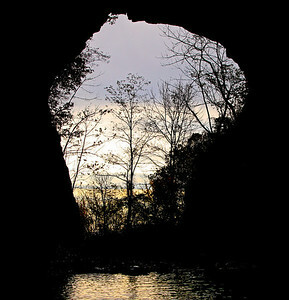 The photo above is a present day view looking east from approximately 1400 feet inside the west portal. Multiple layers of brick are visible here near the east end of the lining.